Taste of Atlanta is Atlanta's premier food+wine+beer+cocktail festival that showcases the diversity of Atlanta's food scene and attracts food lovers from Atlanta, the Southeast and beyond. 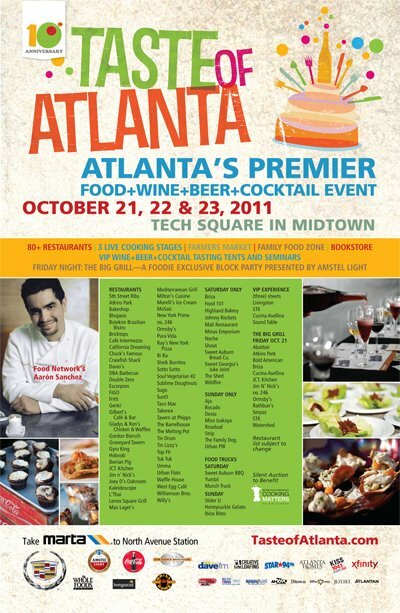 Attendees can enjoy a delicious dinner, discounted tickets to the upcoming Taste of Atlanta festival and live music. COST: The event is FREE to attend. Taste of Atlanta tickets will be on sale for a discounted price of $20 (General Admission) or $70 (VIP), cash only. For more information on Taste of Atlanta, visit www.tasteofatlanta.com. For more information on the Atlanta Food Truck Park, visit www.atlantafoodtruckpark.com.